Here are some faces that I made as a drawing exercise. I'd been looking at The Golden Book of Myths and Legends, illustrated by Alice and Martin Provenson and liked the way that they build figures out of rough shapes. Below is an example. I made 30 or so quick line drawings and scanned them. Usually what happens after this is that I ink out piles of background shapes and scan them, but I wanted to try something different. I bought a Wacom tablet recently and this seemed like a perfect chance to take it for a spin. I had also just found a few bundles of Photoshop brushes from Kyle Webster that seem to nail the kind of inked line that I like to make. Below are the sketches. 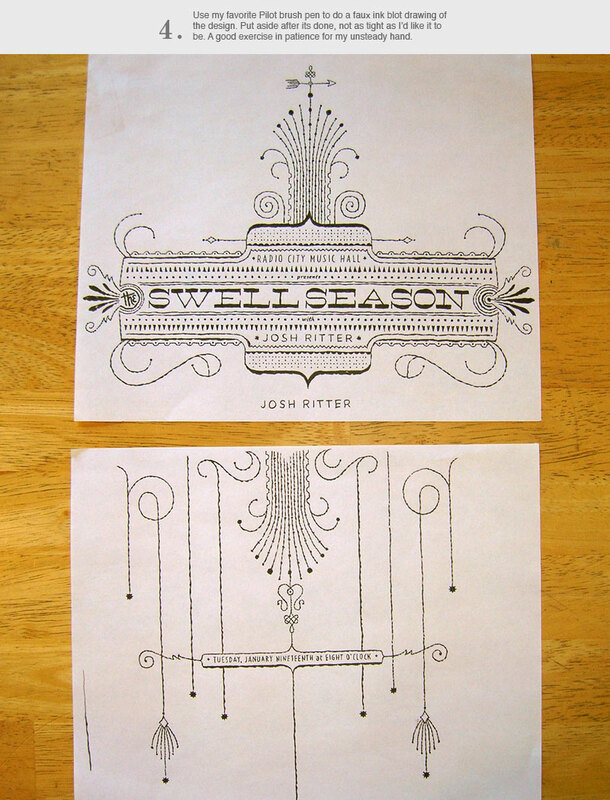 Below is the sketch and the "inked" versions. I like how the Photoshop brushes worked out, I'm going to keep playing with them. Next up I think I'll work on some bodies for these folks and put them in a scene of some sort. Lots of fun! I made this ray gun as an Illustrator demo for my students. The Obfuscator is a short range energy weapon that confuses its targets for short periods of time. Feel free to save the 2560 × 1440 image and use it as a desktop wallpaper. This is an oldie, but folks keep asking me to repost this process so I'm sharing it again. 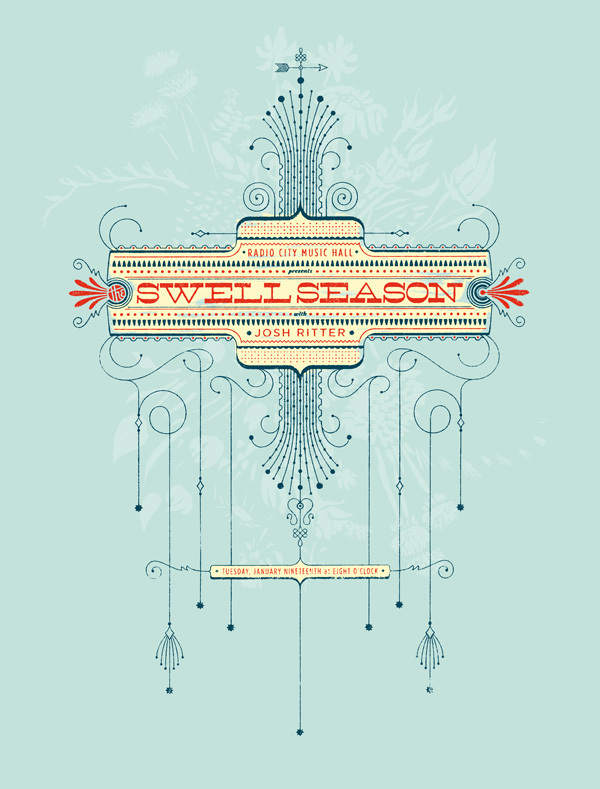 Back in 2010 I was commissioned by The Swell Season to make a poster for a show at Radio City Music Hall. Such an iconic venue required a touch of class. I wanted a light, sensuous, tactile feel, so I went with a highly ornamental design that I drew in Illustrator. I then proceeded to beat the daylights out of the design to dull the precision of the vector lines. Adding some brushy ink drawing to the background helped soften the affair even more, and the final printing resulted in a luxurious, lived-in finish that nailed exactly what I was going for. Scroll through the image gallery to see some of my image distressing tricks. I should have skipped the inked version and the redundant photocopies, veering straight to the xerox transfers, but I was looking for several options to pick from so I tried a few things. The posters sold out halfway through the show, so it was a successful poster. this is definitely one of those posters that must be seen to really appreciate. I just wish I were able to make it up to NYC to see the show! I recently created a series of book cover redesigns as a personal project. My inspiration was a series of science paperbacks from the early 1960's that aimed to bring scientific study to the laymen. I had found a number of them at a thrift store, and the original covers were pretty good. 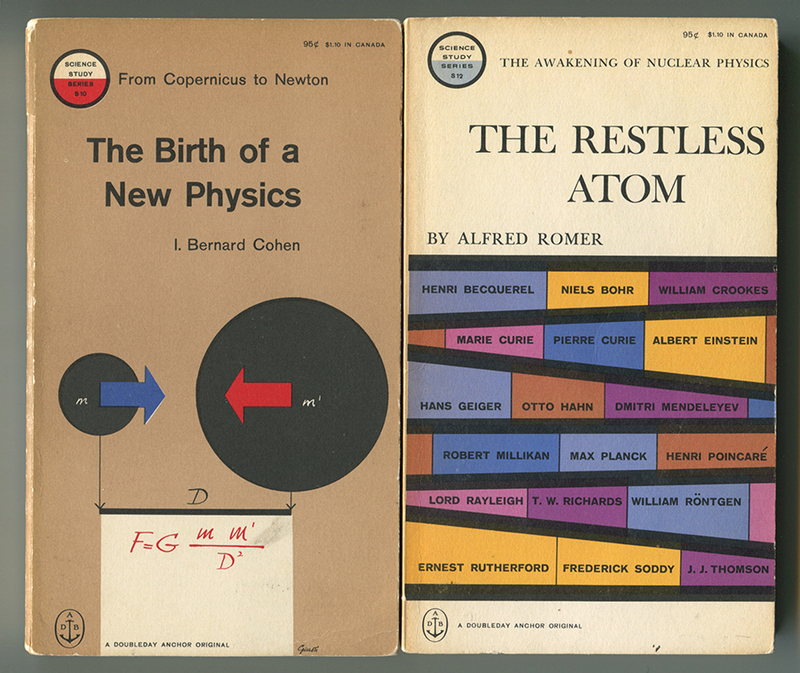 Cover designs by George Giusti. Typography by Edward Gorey! I chose a few titles to work with, and with names like Knowledge and Wonder and The Restless Atom, I had fertile territory for visual exploration. I wanted to keep in a style that nodded to the original series, refreshing the look for a contemporary audience and give myself some new visual ideas to play with. Here are the results. I love this subject matter because it is so abstract and fundamental. Working with pure forms and symbols can be challenging, especially when you are trying to bring life to somewhat dry subject matter. I'm working through another group of covers from the same series, so take a peek back soon for more scientific goodness. A number of years ago a friend gave me some dog-eared old issues of American Artist magazine. It was a stack of a dozen or so mildewy artifacts dating back to 1968-69, largely unremarkable except for one issue that caught my eye; May 1969. 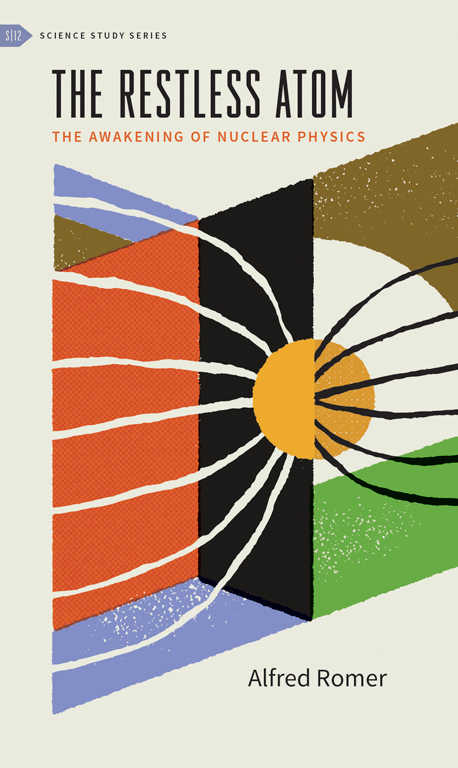 The cover story, "Two California Poster Artists", profiled David Osborn and Charles Woods, a pair of young designers who worked in silkscreen and offset lithography. There was a good selection of their prints featured along with a lengthy interview. The broad shapes, bright colors and loose imagery were bold and lyrical, reminding me of both Matisse's cutouts and Sister Corita's colorful screen prints. At the time that I first saw this, I was just beginning to make screen prints. I loved the bold shapes and overlayed colors, but most of all I marveled at how fresh and lively they looked, even in the yellowed pages of the old magazine. I tucked it away and went about the business of making screen prints for the next ten years. A few years ago, in a stroke of awesome luck, I discovered a number of Osborn/Woods prints for sale on Etsy. It turns out that Charles Woods had passed on and the estate was selling a number of posters and prints from their collection. I immediately snatched up several for myself, and they are beautiful to behold in person. They show their age a little, but for the price they were a steal. Their production process was an interesting cross between screen-printing and lithography, and you can tell that these were carefully and lovingly made. I went back and read the 1969 article and interview in which they detailed some of their inspirations and working methods. For me it's a reaffirming read in that the relationship between the images and the printing method, between artist and printer, was a crucial and inextricable element. In design and illustration today you can see the remnants of this relationship everywhere. Off-registration, ink spread, color overlays and tactile elements that used to be the artifacts of the printing process are now baked into images that may never be printed on paper. It's a clever look in that when executed well it has a comfortable and authentic appearance. 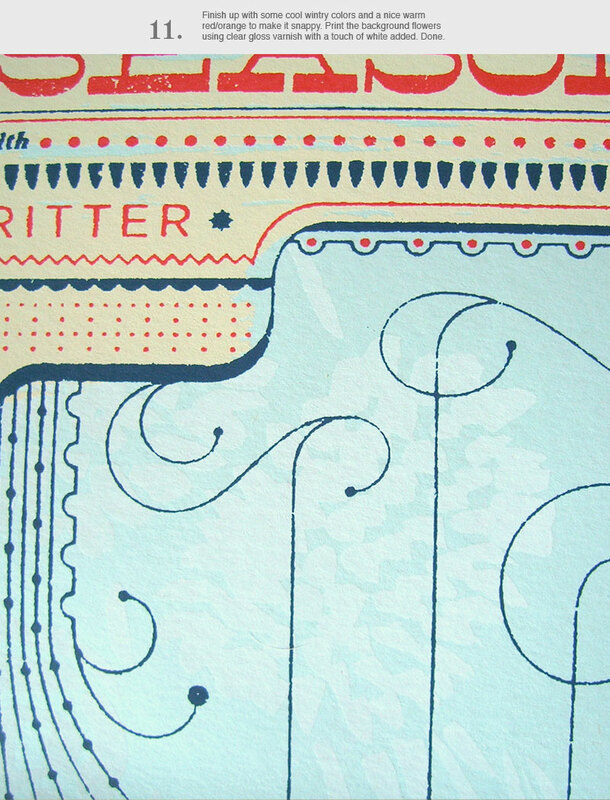 At the same time, limited edition printing methods like lithography, screen printing, and letterpress are often aped on computer screens and then overlooked in production for the robotic ease of giclee printing. So, while I first found the Osborn/Woods posters inspiring for their novelty, style and imagery, I see now that they are more than just beautiful images, they are Beautiful Objects. Click here for the full American Artist interview. Osborn and Woods' original prints are available at etsy. Typography in the mind of the student. incredibly old sketch thing, lovingly titled “origami bird”. Illustrator demo for my UArts students. National Poster Retrospecticus. There’s Tim and a bunch of inspiring poster work.